Microscopy is an essential analytical tool in most fault analysis work and enables us to determine significant information about the cause of the fault, the origin and even compositional information. Initial examination is often performed using low powered binocular microscope to give a general over view of fracture faces and origins or significant features. Initial exmination is non destructive at this stage. For more detailed examination, higher powered light microscopy is often required. This usually requires some form of metallographic preparation or sample preparation and hence will often be destructive to the sample as a whole. This allows detailed cross sections through many different kinds of samples, including plastics, metals, printed circuit boards, paint layers etc. to be analysed. This is often combined with proprietary sample etching techniques to fully develop the sample morphology and structure. 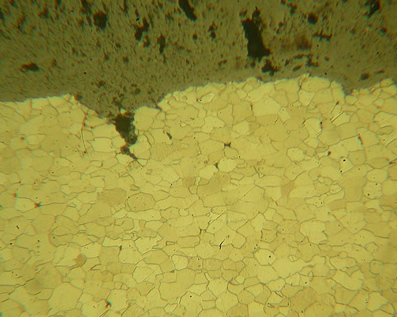 Polished micro section of a failed boiler tube showing grain boundaries and crack propagation. Section through a printed circuit board (PCB) connector pin showing soldering quality and integrity and circuit board defects. Fibre layers are also visible within board. All of our microscopes (optical and digital) are fitted with cameras for image capture and software for on screen measurement & analysis of features. 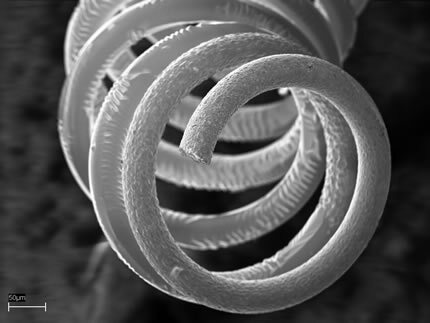 For very small analysis (<10um) scanning electron microscopy is the preferred technique and allows magnifications in excess of x50,000. Analysis by SEM also offers significant depth of field advantages even at low magnifications that can not be obtained with light microscopy. We can offer complete analysis by SEM including sample preparation and elemental compositional data via EDS. SEM is useful for investigating fracture faces in more detail, determining fatigue cycles, investigating thin coatings, investigating structural and morphological variations and much more. In backscatter mode the SEM can be used to produce compositional image maps which demonstrate the variation in composition across a surface. What is SEM and EDS? SEM uses a beam of electrons rather than visible light to illuminate the sample. As the wavelength of this beam is much shorter than visible light it is able to resolve much smaller features. These can approach atomic sizes and hence incredible detail can be obtained. 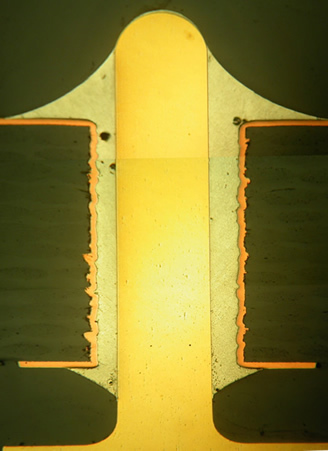 Samples for SEM must be conductive and hence most samples need to be coated either with gold or carbon to produce an conductive path for the beam and prevent charge build up. Materials Technology will conduct all sample preparation as part of our service. Practically any material can be analysed via SEM. This includes metals, plastics, rubbers and composites. However, it is not possible to analyse fluids or liquid containing components as these will boil under the low vacuum that is necessary. The sample chamber size is relatively small, but can still hold a specimen approximately 3” (75mm) square. Images are captured as grey scale photos in TIFF format but are normally converted to JPEG for reports. Hence images appear like a normal black and white photo as shown on this page. 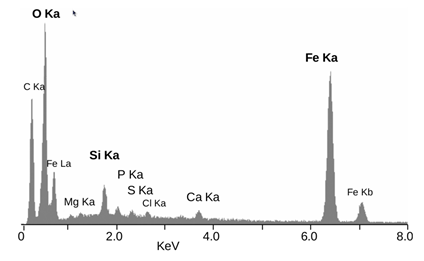 Typical EDS spectrum: Elemental Energy dispersive X-Ray microanalyses of the mineral crust of Rimicaris exoculata, from a mineral particle ~2 μm diameter. The peaks are labelled with the line of the corresponding element. EDS or Energy Dispersive Spectroscopy, some times loosely referred to as EDAX analysis, analyses the x rays emitted from a surface which is subjected to SEM analysis. The energy of the X rays emitted are specific to the atomic structure of the element under analysis. Hence an EDS spectrum can be used to determine elements within the sample. This can be conducted on a qualitative or semi-quantitative basis. The accuracy of the determination depends on many factors and the size of the area being analysed. However, in general levels down to 1% are achievable in most cases. Some of the lighter elements are not possible to detect by EDS and hence it is more suited to heavier elemental analysis. EDS can also be used to identify particle contaminants within a sample and compare this composition to the surrounding material.